Consider the manta. The flat, slick body, at home on the ocean’s surface or hiding in the muck of the ocean floor; the subtle movement, flapping through water. The ubiquity of rays, from smaller variants to the massive mantas, in oceans the world around. The manta is a fascinating creature, and so it should come as no surprise that the manta also makes a fascinating body for an underwater robot. 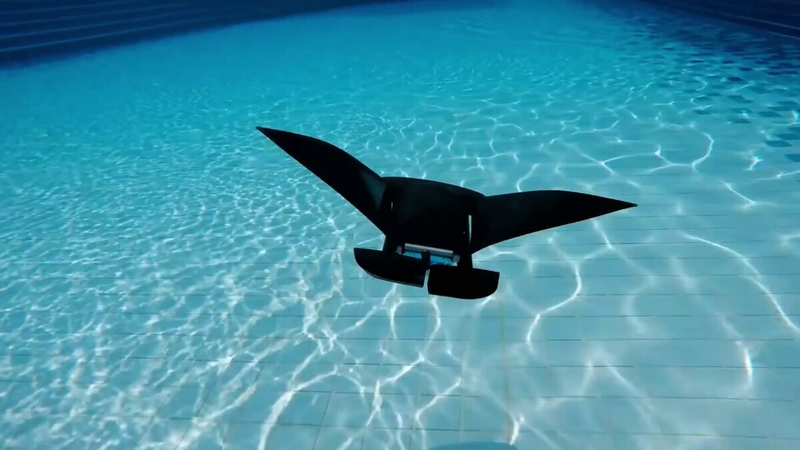 Designed by researchers at the National University of Singapore, the MantaDroid is a manta-inspired robot that propels itself through the water by flapping two flexible wings, and letting fluid dynamics take care of the rest. Each wing is powered by only a single electrical motor each, so the machine has efficiency as well as a snazzy appearance going for it. The robot is small: just shy of 14 inches long and two feet wide. And it’s also light, with the simple body weighing in at only 1.5 pounds. It moves at about 1.6 mph, or twice its body length per second, but what’s really impressive is that it can operate for up to 10 hours. What makes the robot relevant here, though, is not just its efficient motion body or animal-inspired body. What’s relevant is that the MantaDroid is designed to be a future underwater surveillance platform. Putting sensors in an animal-shaped body, especially one that can efficiently navigate the ocean for hours at a time, would make a pretty inconspicuous platform for whoever used it. While the researchers focus on the scientific and public safety aspects of the MantaDroid, the platform would also make a captivating military asset, especially if it could find a way to recharge while out at sea. (There is also the ethical considerations of a surveillance tool disguised as a vulnerable species, and what sort of second-order consequences that might entail). Military dreams of ghost rays will have to wait for further testing. The next steps for the robot are testing at different depths and withstanding currents. Still, it’s not hard to imagine a future where robot rays scout the shallows of an unfamiliar coast days before humans follow, the gentle flaps of robot flippers on sand masking footsteps.